Heat oven to 350°F. Using pencil, trace 9-inch circle onto sheet of cooking parchment paper. Place paper pencil side down on cookie sheet. Make cookie mix dough as directed on pouch. Spread dough on parchment paper in even layer, keeping dough within shape of traced circle as best as possible. Bake in center of oven 25 to 30 minutes or until cookie is firm around edge and soft, but just done, in center. Remove from oven to cooling rack. Cool about 15 minutes. Spread peanut butter in even layer on slightly warm cookie. Cool completely. Arrange banana and strawberry slices on top. Sprinkle with chocolate chips and powdered sugar. Cut into wedges to serve. I like to spread the peanut butter onto the slightly warm cookie to make the spreading process easier. You can wait until it is completely cooled if that works better for you. 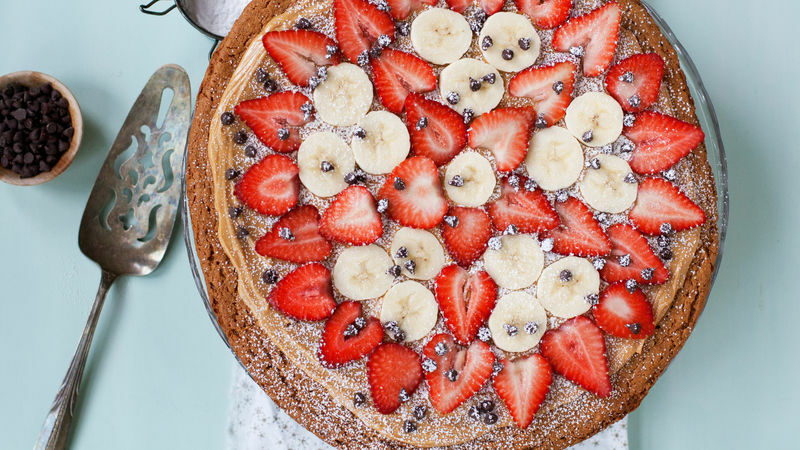 Wait until just before serving to arrange the fruit on top so it doesn’t brown or release too many juices onto the cookie pizza. You can make the cookie a day or two ahead, wrap well in plastic, and store at room temperature before assembling.